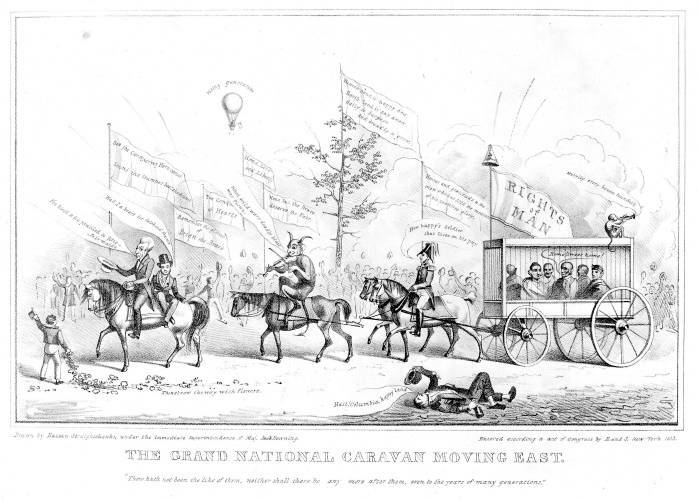 THE GRAND NATIONAL CARAVAN MOVING EAST. A burlesque parade, led by Andrew Jackson and satirizing various aspects of his administration. Weitenkampf asserts that the subject is Jackson's post-election visit to Boston; Murrell suggests a parody of Democratic campaign parades. In fact the print's publication did roughly coincide with Jackson's triumphal tour of the eastern cities New York, Philadelphia and Boston in late June and early July 1833. (The Library's impression was deposited for copyright on July 6, 1833). This artist's portrayal, however, is clearly fanciful. The procession moves from right to left. At its head is Jackson, seated on a horse with Martin Van Buren cross-legged behind him. Next is a devil playing a fiddle, followed by a mounted officer whose horse is one of two drawing a wagon holding caged Indians, with a flag "Rights of Man" and liberty cap. Inside the cage a forlorn Indian sings "Home! Sweet home!" This no doubt refers to Jackson's controversial Indian resettlement program, whereby thousands of Cherokees, Seminoles and other natives of the eastern United States were uprooted and moved to less desirable lands farther West. It probably refers to a specific casualty of this program, Sauk Indian leader Black Hawk, who in 1832 had led an unsuccessful uprising to resist white incursion into Indian lands in Ohio. Touring the Eastern United States as a prisoner of war, Black Hawk and his party arrived in New York on June 12, 1833, coinciding with Jackson's own visit there. The singing Indian resembles Charles Bird King's portrait of Black Hawk, painted in 1832. In the background are a cheering crowd, a hickory tree and a balloon overhead marked "rising generation." The figures sing lyrics from various songs. Jackson: "I've kissed and I've prattled to fifty fair maids." Van Buren: "Had I a heart for falshood fram'd." Devil: "When wild wars deadly blast was blown." Soldier: "How happy's [the] soldier that lives on his pay." Monkey atop the wagon: "Merrily every bosom boundeth." Prostrate drunk in foreground: "Hail! Columbia, happy land." Flags with various messages fly above the crowd, saying "See the Conquering Hero comes / Sound the trumpet beat the drums." and "Remember the glories of Brien the Brave" and "Honour and gratitude to the man who has filled the measure of his countrys glory." Atop the hickory tree flies a banner with "Heaven send it happy dew, / Earth lend it sap anew / Gaily to burgeon / And broadly to grow." Below the title is the quote, "There hath not been the like of them, neither shall there be any more after them, even to the years of many generations." The print is particularly well drawn, and may be the work of John Bufford. It compares closely to "The Government" (1834-12) and "Grand Fantastical Parade" (1833-12), also issued by Endicott & Swett in New York.